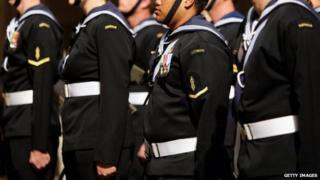 An Australian naval training base in Victoria was locked down for several hours after "hazardous material" was found during a routine inspection. Navy staff found the material in the room of a sailor living on the HMAS Cerberus base, said local media. Authorities established a 400m (1,312 ft) exclusion zone around the base, south-east of Melbourne and arrested the 30-year-old sailor. The police later said the material posed "no immediate threat". Victoria Police superintendent Neil Paterson said the items were "generally not found together, they are of concern to us" but did not appear to be explosives, reported ABC News. He added that the base remained secure and that there was no link to terrorism. "There has been no immediate threat, given the nature of the materials and no life has been at threat here on the site," he said. Members of the bomb response unit and the arson and explosive squad were investigating the materials. The lockdown has now been lifted. HMAS Cerberus is located 70km southeast of Melbourne, on Crib Point. The 1,517ha naval base hosts about 800 trainees at any one time, according to the navy's site.